Charlotte, N.C. – Jeff Gordon Children’s Foundation and Kick-It will be teaming up on the kickball field by challenging supporters to kick cancer out of every childhood once and for all. Kick-It is a national grassroots fundraising game that was started by Quinn Clarke, a cancer survivor who wanted to make a difference in every child diagnosed with cancer. Kick-It brings community, family, friends and co-workers together to raise money for childhood cancer research. The concept is easy—kick the ball, run the bases and score big in the fight against pediatric cancer. “I am really excited about this new partnership,” said Jeff Gordon. “We are confident this will take childhood cancer to the forefront and bring it the awareness and funding it deserves. I can’t wait to Kick-It in September when I host my won game in Atlanta. Additionally, Jeff Gordon Children’s Foundation has launched a new social media campaign centered on the Kick-It program called “I’m Kicking-It”. To participate, download the Kick-It sign, write your reason to support the initiative and upload it to the Jeff Gordon Children’s Foundation Facebook page. “I’m Kicking-It” campaign will feature people from all walks of life who support the cause, from pediatric cancer patients to professional athletes. Then each week, Gordon will pick his favorite “I’m Kicking It” reason. “We truly admire Jeff Gordon’s commitment to children with cancer. Our son, Quinn Clarke, founded Kick-It with the dream to raise enough money to find a cure. He is beyond excited that Jeff Gordon is kicking it with him and the 13,500 children diagnosed with cancer every year,” said Allison Clarke, Founder of Flashes of Hope and mother of Quinn Clarke. 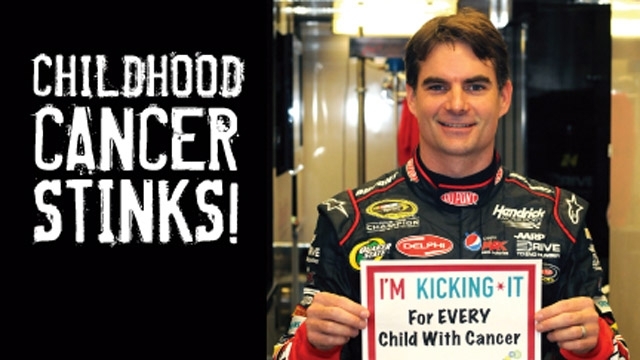 For more information visit www.jeffgordonchildrensfoundation.org or www.kick-it.org/jeffgordon.